Set the tone of your party and get an easy boost to your New Year’s festivities with simple decorations. If you’re like me, you’re still reeling from Christmas and the thought of elaborate decorations that cost a fortune aren’t what you’re looking for. 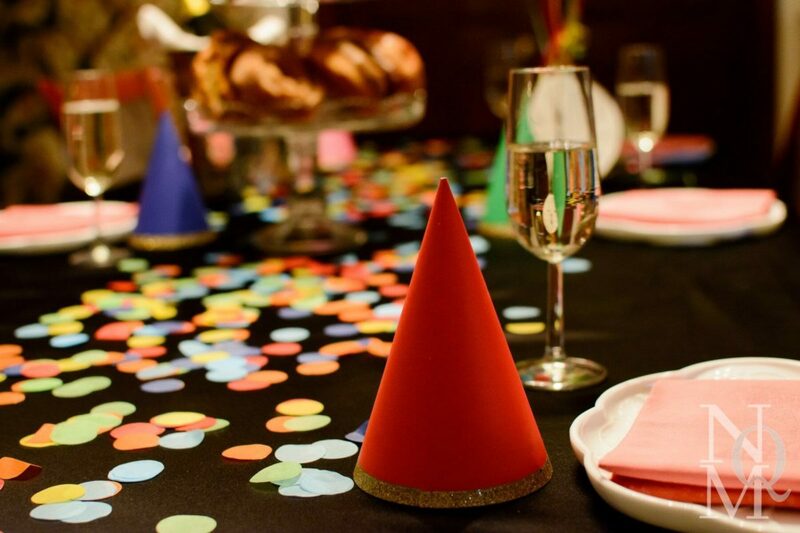 My decorations are simple yet very festive and stylish: black tablecloth, colorful confetti, party hats and helium balloons, as well as a donut tower with 2019 sparkling candles and a clock. Choose your neutral. Depending on what you own (or what you’re interested in buying), choose either black, grey,or white as your neutral anchor; I went with black this year and found a heavy satin look tablecloth on Amazon for a mere $15.75. The sheen from the satin really added to the vibe of the decorations and satin ribbon touches here and there carried it throughout my house. Opt for a fun color scheme. Lots of people go silver or gold as an accent which is lovely, but to stand out and create a fun vibe, try multicolored brighter accents like Meri Meri party hats (2-day shipping option available), confetti (I love the big sized tissue variety shown), napkins, and balloons. Serve food that matches your décor colors. An easy addition to the décor is pops of color from well-displayed food choices; try glass cake plates stacked with pretty desserts like the donut tower shown, a bar area with juices, orange and lemon wedges, or a buffet set up with fresh berries. Add a few fun touches like a clock and 2019 &/sparklers or candles, or giant mylar number balloons and a banner. Carry similar decor elements to other party zones. Don’t forget the buffet in your kitchen, the bar area, and even your guest bathroom so add things like a black table runner, more confetti, and a few balloons along with party hats &/or horns scattered here and there. Choose champagne or prosecco that’s both well-rated and has a pretty label so that it adds to the décor color scheme when you display it in an ice bucket (or bowl). Buy helium balloons from a store that adds ‘high-float’ so that you can pick them up in advance and won’t risk them drooping by the time the party starts. Display balloons in clumps of odd numbers: bouquets of 3, 5, or 7 look a lot more festive than single balloons tied here and there. Consider renting tablecloths, champagne glasses and other party items like chafing dishes to keep food warm; the cost is generally quite moderate and it saves you a ton of work washing and storing after the party. Use glass champagne flutes or serving dishes instead of plastic; I have a bargain set that I don’t have to worry about folks breaking them. For a kitchen runner that’s got impact but is a bargain, try extra wide 4-6” black satin ribbon that runs the length of your buffet area. Or, pick up a long black plastic or paper tablecloth and do not fully unfold it, just open it lengthwise so that you have a long 10-20” strip then trim the ends in a simple angle cut to look like a ribbon and voila, you have a $3 runner. So there you have it: with minimal effort and spending, you’ll feel the weight of pre, mid, and post festivities lifted off your shoulders which will free you up to ring in the New Year with a sense of light-heartedness as you enjoy your company and are able to be fully present! All photos by Laura Taylor unless otherwise stated.